Based on the pattern Idyllic by Corey Yoder of Coriander Quilts, Spokesong is named after the play by the Irish playwright Stewart Parker that takes place in a bicycle shop in Belfast during the Irish troubles. Do you see bicycle wheels and spokes when you look at the blocks with radiating star points? 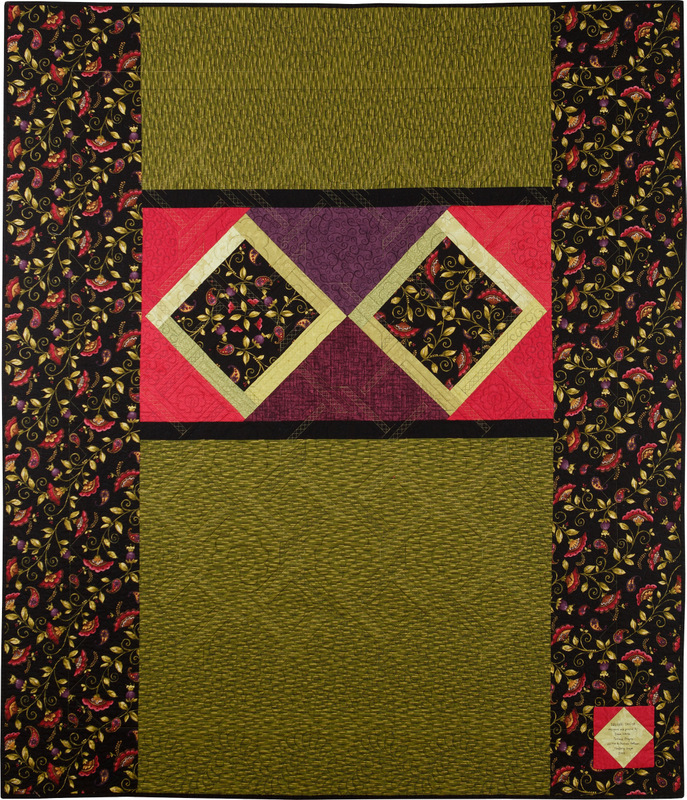 Spokesong was quilted by Karlee Sandell of SewInspired2Day using a motif called Serpentine. Click here to see more photos of the front and back as well as close-ups of the quilting. This 57″ x 58″ lap quilt was made for one of my six granddaughters, a young wife and mother of three little boys. I wanted her to have a decidedly feminine quilt. The block design is from Karin Hellaby’s book Pineapple Plus. I added an extra round of triangles to increase the block size and added sashing between the blocks. The quilting motif is Baptist Fan, quilted by Karlee Sandell of SewInspired2Day. For more about the making of this quilt, click here. Both quilts were quilted by longarmer Karlee Sandell of SewInspired2Day. The quilting is all hand-guided ruler work. For more photos of the backs of the quilts and quilting details, see this post. Dutch Treat was begun during a January 2017 snowstorm that kept me inside for several days. The pattern is A Mid-Winter’s Night by Cottage Rose. I saw the quilt made up in aboriginal prints in a quilt shop in the fall of 2016 and knew immediately that I wanted to make a two-color version. The main block — a reworking of the classic Winding Ways block — features a pinwheel inside a windmill. The block design and the strong contrast of value in the fabrics create the illusion of overlapping circles even though all the seams are straight. I resized the block from 9″ to 12″ and made a change to the position of light and dark fabrics in half of the pinwheels. Leftover “V” blocks went on the back. Longarm quilter Debbie Scroggy of All Quilted LLC quilted a circular motif reminiscent of crop circles to emphasize the illusion of overlapping circles. To see close-ups of her work, see this post. I incorporated leftover blocks on the back, setting them on point and enlarging them. You can see the supersized block on the far right has an extra round of strips. The edge-to-edge quilting motif incorporates loops and swirls that echo one of the prints in the quilt. Click here for a better look at the quilting details. The name of this quilt was inspired by the 1944 song (music by Victor Young, lyrics by Ned Washington). I started with the Spinners block by Heather Peterson of Anka’s Treasures, using fabric repeats instead of different fabrics in the triangles surrounding the center hexagons. I called the result “kaleido-spinners.” The four hexagons in the outer part of the quilt are true kaleidoscope blocks. Inspiration for the setting came from Heather Peterson as well. The stars are not just in the design. The background fabric on the front looks like stars swirling in a night sky, and I used starry fabrics on the back as well. I was delighted with Karlee Sandell’s free motion quilting. For close-ups of her work, click here. This is my version of Karla Alexander’s pattern Rewind. The wonky Greek key block reminds me of the @ sign on a keyboard, hence the name. I started this quilt in July in Karla’s class at Quilter’s Affair 2015. The gentle curve of the quilting motif softens the hard angles of the blocks. For the back I used one large leafy batik print and made a wonky Greek key block for the label. This quilt was awarded a second place ribbon in the intermediate quilt category at the 2017 Northwest Quilting Expo. Dragonfly Kisses is my simplified version of Sew Kind of Wonderful’s Chic Diamonds pattern. Most of the fabrics are from a new line called “Dance of the Dragonfly” by Kanvas Studios for Benartex. I paired them with three aqua batiks and floated the blocks on a pale mint background. Longarm quilter Sherry Wadley and I chose a simple edge-to-edge motif that echoes some of the curves and circles in the fabrics. I bound the quilt in the background fabric so the blocks would continue to float rather than be framed. Leftover strips of fabric went on the back for a simple pieced backing. Ring Toss, based on the double wedding ring block, was made using the mini Quick Curve Ruler (QCR Mini) and the pattern Mini Rings, both by Sew Kind of Wonderful. Instead of sewing four fabrics together in strip sets to make the rings, I used one piece of fabric, a lively print of overlapping circles that makes me think of ferris wheels and fireworks, common sights at carnivals. Those images are what led me to the name Ring Toss. This little quilt was expertly quilted by Karlee Sandell of SewInspired2Day. To see close-ups of Karlee’s quilting, click here. This king-size bed runner was made using the design Spinners from Heather Mulder Peterson’s book On the Run Again (Anka’s Treasures, 2014). I increased the blocks from three to five and added to the width of the runner to make the blocks float. The name comes from the fabric line, Wander, by Joel Dewberry for Free Spirit Fabrics. I used three prints from that line in the triangles that spin around the center hexagon. I liked the floral fabric so much I put a big piece on the back and made the runner reversible. WanderLust was beautifully quilted by Coleen Barnhardt of the Quilted Thistle. To see close-ups of her work, see this post. This little quilt is the result of a workshop I took with Pat Pauly, a renowned fiber artist from New York who came to Portland in the fall of 2015 to teach her “New Big Leaf” design using freezer paper templates. To read my posts about the making of Loose Leaf, enter “new big leaf” into the SEARCH ME box on the sidebar to the right of your screen. Do you recognize the classic Churn Dash block set on point? I added some alternating blocks that also have 4-Patch Wonder blocks in their centers and floated all of them on a plain background. The addition of the 4-Patch Wonder blocks — each one unique — adds sophistication and complexity to what is essentially a simple quilt design. The back of the quilt shows off the focus fabric as well as a test block I made of another pattern (Cosmic Delight by Freckled Whimsy). Longarm quilter Debbie Scroggy of All Quilted, LLC quilted an all-over swirly design that did its job: softening the sharp edges and angles of the blocks. I call this a “just for fun” quilt, started because I had some focus fabric left over from my previous project (Olivia Twist, below) and wanted to use it in the center of a large star block. One block became four, and soon I had a finished quilt. Do you see the secondary star in the center of the quilt? I added a little faux-kaleidoscope block in the very center to call attention to it. The quilt is named after my mentor and quilt teacher Billie Mahorney, well known for her love of star motifs in quilts. Nancy Stovall of Just Quilting quilted undulating waves across the horizontal surface. For close-ups of Nancy’s quilting and information about the making of this quilt, see this post and this one. Olivia Twist gets its name from that floral fabric and from the venerable twist block, which made its first appearance in 1870. The name is also a nod to one of my favorite authors, Charles Dickens. When I discovered that Dickens died in 1870, the same year that the twist block was first published, the name seemed even more fitting. I asked Jolene Knight of Good Knight Quilts to quilt this bedrunner using her free-motion quilting skills and was delighted with the results. You can see details of her quilting in this post. Who can resist a beautiful toile, especially in the classic color combination of blue and white? This quilt is based on Alex Anderson’s Checkerboard Square pattern and features fabrics from her Never Enough Romance line for P&B Fabrics. The pattern and the fabrics came out in 2008. On the back of the quilt I created a large (37″ square) Goose in the Pond block, positioning it above and to the left of center. To see close-ups of Debbie’s beautiful quilting, see this post. My most ambitious undertaking to date, Catch a Falling Star is based on a design by Terri Krysan called Reach for the Stars that was offered in Quilter’s Newsletter over the course of seven issues, beginning with Oct./Nov. 2013 and ending with Oct./Nov. 2014. I replaced three blocks and made a few changes to some of the other blocks. I also challenged myself to incorporate a fussy-cut image into every block and redesigned the border to make it symmetrical. The two Jacobean floral prints on the back of the quilt were the source of most of the fussy-cut images on the front. Many of my blog posts in 2014 were about the creation of this quilt. If you are interested in seeing how it came together, block by block, type Reach for the Stars into the Search box on the upper right side of the home page; the posts will come up in reverse chronological order. To see close-ups of Loretta Orsborn’s beautiful quilting, see this post. This little quilt was the product of a summertime Quick Curve Ruler Sew-Along organized by Thelma of Cupcakes ‘n’ Daisies. The pattern, Dancing Churndash, was designed for Cut Loose Press by sisters Jenny Pedigo and Helen Robinson of Sew Kind of Wonderful. I knew immediately that I would make this quilt using fabrics from the Gray Matters line by Camelot Cottons. I’ve loved the combination of gray/yellow/white ever since my mother made me a wool plaid skirt in those colors when I was in high school. To read more about the making of Good Day Sunshine, see this post. To see close-ups of Jolene Knight’s beautiful quilting, see this post. Another quilt featuring the 4-Patch Wonder Block (my name for blocks made of four repeats yielding a faux-kaleidoscope effect). With Banana Split, I centered the 4-patches in Sawtooth Star blocks and added simple sashing with cornerstones. Then I added 4-Patch Wonder blocks in the corners offset with narrow black accent strips. On the back of the quilt I incorporated some of the original focus fabric — those are clusters of bananas — and added an 18″ star block. The circle in the center of the star started out as an octagonal kaleidoscope block made with eight 45° triangles. You see? Banana splits on both sides of the quilt. To read more about the making of this quilt, see this post. To see close-ups of Debbie Scroggy’s quilting, see this post. An original design, based on the classic twist block dating back to 1870. In terms of piecing, Square Dance was not difficult to sew. The challenge came in arranging (and then keeping track of) the 12 different fabrics — four roses, four purples, and four greens — used to make the lattice strips. The straight lines of the lattice strips and border squares offset the swirls, curves and curlicues in the floral focus fabric. To read more about the making of this quilt and to see close-ups of Melissa Hoffman’s quilting, see this post. Honeymoon in Paris gets its name from the Paris-themed fabric (two prints on the front and the Eiffel tower on the back) and the double wedding ring block design. The fleur-de-lis motif in the quilting adds a bit more French flavor. The pattern is “Metro Rings” by Sew Kind of Wonderful. To read more about the making of this quilt, including the quilting by Debbie Scroggy, see my post here. Lyra’s Quilt, #7 in my series of kaleidoscope quilts. After making Cosmic Kaleidoscopes (see below) in early 2013, I wanted to make a smaller version using just three oversize kaleido blocks. This quilt, a gift for my new great niece, was the result. Click on the picture at right to get a better look at the hydrangea focus fabric. That circular flower in the upper left was made from a leftover kaleido block. To read about the making of this quilt and Nancy Stovall’s quilting on it, see my post here. Hunky-Dori was made using the pattern “Urban Tiles” by Jenny Pedigo of Sew Kind of Wonderful. The name comes from the expression “hunky-dory,” meaning “fine and dandy,” but incorporates the name of the focus fabric I used, Dori by Mitzi Powers for Benartex. For more details about the fabrics I used, see my post here. Black and white — such a timeless combination. Day for Night is based on “Silhouette,” a design by Kari Nichols that was introduced in the March/April 2012 issue of McCall’s Quilting magazine. The pattern calls for pairs of prints that are positive/negative. I had a few in my stash and found some additional fabrics in the Night and Day line by Exclusively Quilts. I modified the design to reduce the number of seams in the triangles and squares. To read about the making of Day for Night, see my post here. Note that the quilt is bound in the same two fabrics used in the outer borders — but with the opposite value. To read more about the binding treatment, see my post here. On the back: a whimsical black-and-white print featuring dress forms, spiced up with a jolt of fuchsia. Cosmic Kaleidoscopes, #6 in my series of kaleidoscope quilts. To me this quilt represents a juxtaposition of traditional and modern sensibilities. I used a traditional Jacobean floral fabric in the kaleidoscope blocks and then floated those blocks on a borderless background. Nancy Stovall of Just Quilting quilted wavy lines that simply flow off the edges. Click on the picture at right to get a better look at the focus fabric. I inserted a strip of it on the back and added some half-kaleido blocks made from the leftover fabric. Nancy used a lighter thread for the kaleidoscope blocks, creating an almost lacelike effect on the back. To read more about the making of Cosmic Kaleidoscopes, please see my post here. Sunrise Bow-tique started as an exercise in making bowtie blocks using raw-edge applique fused with Steam-a-Seam-2. It ended as an exercise in using a gradated ombre fabric in the alternating blocks — simply because that was the only fabric I could find that I really liked with the bowtie blocks. Serendipity! To read more about the making of Sunrise Bow-tique, please see my post here. To read more about Nancy Stovall’s quilting on it, please see this post. Another version of my 4-Patch Wonder pattern. This one was made from Lakehouse Dry Goods fabric (Hydrangeas and Raspberries by Holly Holderman). The border fabric, Sweet Dreams by Robyn Pandolph for SSI, is so soft it feels almost like flannel. It features scrolls and vines and leaves, which led me to the quilting motif. Click on the photo at right to see a close-up of the original focus fabric. To read more about the making of Framboise, please see my post here. Ode to Spode, #4 in my series of kaleidoscope quilts. My inspiration for this quilt was Judy Johnson’s “Cascading Kaleidoscopes” design, but in addition to the 6” and 12” blocks of Judy’s design, I added some 9” blocks to the mix. There are close to 1,000 pieces in this quilt. I had made only a few blocks when their similarity to the dozens of blue and white china patterns made by Spode jumped out at me, hence the name. You can see the original focus fabric on the back of the quilt. Saw the fabric (Deco Delight by Fabric Freedom). Had to have it. But – what to do with it? A friend suggested I make a quilt using my own 4-Patch Wonder pattern. The overblown poppies were way too big to be contained in a 6” block, the measurement in the 4-Patch Wonder pattern, so I made a new pattern with a 9″ block and named it (and the quilt) Tiffany’s Garden because the blocks and setting triangles reminded me of the stained glass work of artist and designer Louis Comfort Tiffany (1848-1933). Pattern available: Tiffany’s Garden. Two sizes included: full (72″ x 90 ½”) and queen (90 ½” x 109″). A version of this pattern using 6” center blocks is available under the name 4-Patch Wonder. See Framboise, Marrakesh Express and Midnight in the Garden in this gallery. The heart-shaped design, the Eiffel tower, Paris map and French poodle fabrics . . . what else could I call this quilt but I Love Paris? Even the white background fabric has hearts on it, and there are different heart motifs in the quilting. Like many of my quilts, I Love Paris started out as an experiment. I wanted to make tessellating pinwheels that finished at 6”, so I transferred the markings from the small Lil’ Twister tool by CS Designs to a 6½” square ruler and made my own template. I decided to float the heart with no border treatment, but after the heart was done I could see that it needed something extra. How about a shelf for the heart to sit on? The small Lil’ Twister tool gave me a row of 3” finished pinwheels, the perfect proportion for the larger blocks and the perfect resting place for the heart. Directions for making this quilt are available as a tutorial. Everything old is new again. It’s All in the Twist is a happy union of the traditional twist block dating back to 1870 and the contemporary kaleidoscope block. I came across a picture of the twist block with a solid octagonal center and thought, “Wouldn’t a kaleidoscope block look great there?” I couldn’t wait to try it out. So much so that I tried it out first with my favorite faux-kaleido block – the 4-Patch Wonder, of course. Paired with red and green ribbons against a solid black background, the gorgeous Jacobean floral fabric (Bellagio Road by RJR Fabrics) translated into wonderfully varied faux-kaleido blocks. Click on the the photo of the back to see a larger image of the focus fabric. As an Audrey Hepburn fan, I am especially fond of one of her earlier movies, Sabrina (1954).Do you remember the scene in Paris where Sabrina is in cooking school learning how to crack an egg properly (i.e. one-handed) under the unnervingly stern glare of the French chef? “It’s all in the wrist,” he says. That’s where the title of this quilt came from. Pattern available: It’s All in the Twist. There is just something about Jacobean florals; almost without exception they make the most beautiful faux-kaleido 4-Patch Wonder blocks. I teamed this gorgeous fabric, Carmen by Timeless Treasures, with a metallic celadon green and flat black, and was thrilled with the result. Click on the image at right to get a better look at the focus fabric. Carmen, as the quilt was originally named, was exhibited at the 2011 Stitches in Bloom quilt show in Silverton, Oregon, where it won the viewers’ choice award for best traditional quilt. I’m sure Melissa Hoffman’s outstanding quilting had something to do with that award. Later I renamed the quilt Midnight in the Garden. The rich colors of paprika, pepper and ginger in this fabric (Marakesh by Maywood Studio) bring to mind exotic spices traded centuries ago along the Silk Road. I knew the print would yield simple but striking 4-Patch Wonder blocks. Click on the photo of the back to see a larger image of the focus fabric. V8, #3 in my series of kaleidoscope quilts. Inspiration for the name came from the focus fabric (Variegated Garden by Martha Negley for Rowan Fabrics), which reminded me of red ripe tomatoes and leafy green vegetables, ingredients of a certain tomato juice beverage. Then it occurred to me that each kaleidoscope block contains eight V-shaped wedges. In this quilt I turned the octagons into circles and floated them on green backgrounds, then added tomato red diamonds at the corner of the blocks for an extra pop of color. I got a little carried away using leftover blocks on the back. Click on the photo at right to see a larger image of the focus fabric. I couldn’t bear to use too much of this charming retro New York fabric from In the Beginning Fabrics, so I made a small 4-Patch Wonder quilt. I wasn’t crazy about some of the blocks as 4-Patch Wonders so they became “sliders,” i.e. four-patch blocks with the images right side up. The cornerstones are New York Beauty blocks, a nod to Lady Liberty’s crown. I am sure I spent more time making those corners than I spent on the rest of the quilt. I think I like the back of the quilt almost as much as the front. Based on Judy Johnson’s “Cascading Kaleidoscopes” design, Ramblin’ Rose is #2 in my series of kaleidoscope quilts. The fabric is from the line Barefoot Roses by Tonya Whelan for Free Spirit Fabrics. That fabric can be seen on the back of the quilt, along with my original flowerpot design using halves of leftover kaleidoscope blocks. Have you ever found a fabric so beautiful you almost couldn’t bear to cut into it? Such was the case with this fabric in Tonya Whelan’s Barefoot Roses line for Free Spirit. Fortunately, I bought a lot of it. I used it first in Sandy’s Rose Garden, shown here. It has since made its way into another quilt (see Ramblin’ Rose), a bathrobe, and a pair of pillowcases. Who knows where it will show up next? Sandy’s Rose Garden is based on the pattern “Four-Patch Stacked Posies” by HD Designs. I departed from the design by adding a narrow strip in the sashing, a flange around the outside, and corner blocks in the outer border. The cornerstones in the interior of the quilt were fussy cut from a piece of vintage checked fabric. Leftover blocks went on the back. Click on the photo at right to see a larger image of the focus fabric. This is Fiesta, the quilt that got me hooked on the kaleidoscope block and inspired a series of kaleidoscope quilts. Based on Maxine Rosenthal’s book, One Block Wonder, and Judy Johnson’s “Cascading Kaleidoscopes” design, it’s made up of 6” blocks with a scattering of 12” blocks thrown in the mix. I picked a wild floral print – in this case Kirman by Kaffe Fassett for Rowan Fabrics – because I figured it would produce blocks with great variety in color and form. I could hardly wait for each block to reveal its own unique design. The profusion of warm and hot colors, the original motifs in the focus fabric, and the finished kaleido blocks all contribute to a distinctly southwestern feel, which led to the name Fiesta. Unused blocks went on the back, along with a piece of the original focus fabric. Click on the photo at right to see a larger image of the focus fabric.